During September through November, wildfires tore across parts of drought-stricken Peru. Peru’s Amazon was then experiencing its worst dry period in 20 years. And, at the time, over 100,000 acres of rainforest and farmland was consumed by flash fires. Rainforest species, ill-adapted to fires, were caught unawares. And a tragic tale of charred remains of protected species littering a once-lush, but now smoldering, wood spread in the wake of the odd blazes. At the time, scientists noted that the after-effects of El Nino had combined with a warmer world to help spur the drought and the fires. And they warned Peru to prepare for more extreme weather in the future as Earth continued to heat up. Fast forward to 2017 and we find that the moisture regime has taken a hard turn in Peru as the droughts and fires of 2016 gave way to torrential rains. Since January, more than 62 souls have been lost and about 12,000 homes destroyed as flash floods ripped through Peru. Over the past three days, the rains have been particularly intense — turning streets into roaring rivers and causing streams to over-top — devouring roads, bridges and buildings. As of yesterday, 176 districts within the country have declared a state of emergency due to flooding. The rains come as coastal waters off Peru have seen sky-rocketing temperatures. 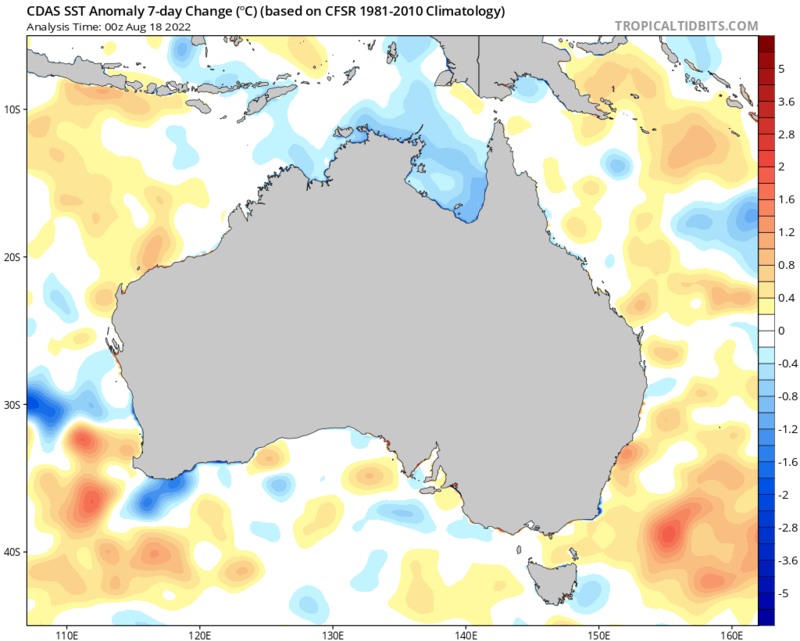 Sea surface readings over recent months have climbed from an average of 24 degrees Celsius to 29 degrees Celsius. These extremely warm waters are pumping a huge plume of moisture into the local atmosphere. And it’s this extraordinarily heavy moisture loading that is spurring the massive rainstorms now plaguing the state. Scientists call this phenomena a coastal El Nino. And the last time Peru experienced one was in 1925. Though the coastal El Nino probably helped to spur the extreme rains now plaguing Peru, the peak sea surface temperatures of the very warm waters off Peru have also been increased by the larger human-forced warming of the world (primarily through fossil fuel burning). So many scientists are also now saying that the severe rainfall events now occurring in Peru were likely contributed to by climate change. The climate extremes Peru has experienced — flipping from flash drought and wildfires to flash flood in just 5-6 months is exactly the kind wrenched weather we can expect more and more from climate change. For as the Earth warms, the amount of moisture evaporated from lands, oceans, lakes and rivers increases. As a result, the hydrological cycle gets kicked into higher gear. And what this means it that droughts and fires will tend to become more intense even as rains, when they do fall, will tend to be heavier. Great to touch on this as I have some Peruvian friends and they are very concerned but most Americans barely know where Peru is! It seems as tho this has parallels to California which had a similar drought and then torrential rain this year. There’s more storms and rain forecast for California next week. It’s getting late in the season for rain so even this is slightly abnormal. It seems to me the warm Pacific is helping fuel both Peru’s and California’s rain. They both seem to have parallels. Does that make sense? Lots of moisture loading in certain regions of the tropics at this time. Also note the rivers of moisture streaming across the Pacific toward the west coast of North America. The Eastern Equatorial Pacific is getting a punch from the developing El Nino. The U.S. west coast saw quite a lot of moisture due to a strengthening storm track and related latitudinal dipole temperature anomaly. The one thing that’s related is that sea surface temperatures in many regions near the Equator are well above average and this is feeding into various rivers of moisture via the ocean evaporation mechanism. The atmospheric river currently cascading onto Australia’s east coast has brought minor to moderate flooding to many of NSW coastal regions over the past few days. Some of the already flooded regions are expecting another 200mm+ tomorrow so it might turn major soon. That particular river of moisture looks unusual in that it’s headed in a westerly direction, while all the others on the planet seem to be headed east. hmmm. PS – even though I’ve been spared the worst of it so far, it was so wet here a couple of days ago that as I stepped out of my front door I was confronted by a fresh water crayfish waving his arms at me – that’s how wet it was. It is pretty amazing that so many floods and other disasters have happened in such little time with very little publicity. Tiger, I’m not amazed.There is definitely “extreme weather fatigue going o”n. I live in Britain, and I remember that floods affecting the Vltava and Elbe rivers in central Europe back in (I think) 2000 were major news over here. When similarly devastating floods affected the Danube a couple of years ago, with cities like Passau, Germany, very badly affected, there was very little coverage. So there’s a lot more chatter about climate change lately. People are seeing the extreme weather and they’re worried. I am now part of 4 grassroots groups that started after 11-9. And two of them have Environmental/CC subgroups. And I can tell you they are some of the biggest subgroups in terms of interest . I am seeing a lot more talk on these subjects. I don’t know if it is because of living in Florida and more people are tuned in because of SLR..or if CC is just finally hitting enough tipping points that it is seeping into people’s consciousnesses. What ever it is..I am happy to see it..and I will hold on to “good” news and celebrate it when ever I come across it. BTW..Peoples Climate March coming up on April 29th in D.C with Sister Marches popping up all over. I am hoping we can make as big a “splash” with this as the Women’s March did. Also, I would say the people I am meeting in these new grassroots groups…over 90% have NEVER been involved in political activism…Fingers crossed this enthusiasm continues. Thanks with posting this great video…She rocks! Love it! In my heart of hearts ….I am counting on our love of our children and the children themselves to be the key to solving the crisis. That’s not ‘fatigue’ Bill-that is the entirely Rightwing, business owned, Western fakestream media suppressing the facts, because they call the entire neoplastic capitalist system into question. It’s fallen apart in much of the world, but the Anglosphere, under the death-grip of neo-liberal capitalism and the psychopaths it empowers, is the last redoubt of auto-genocidal insanity. I’m just watching the local Sunday morning political gab-fests, and the cavalcade of vicious imbeciles from our ruling regime is deeply depressing and enraging. This is a bit O T but, ran into this on CO2 , a very nice video on co2 rise and a great article . Pieter Tans has presided over the Carbon Cycle Greenhouse Gases Group for 32 years, bearing witness to the immense changes happening in our atmosphere. He discussed with us his career, the acceleration in atmospheric CO2 and why monitoring Arctic air is so important…https://www.newsdeeply.com/arctic/articles/2017/03/16/establishing-the-earths-atmospheric-record-one-air-flask-at-a-time . Thanks for this, not OT at all. This sort of mad oscillation from one extreme state to another is the essence of climate destabilisation. We in Australia are seeing it all the time, with one side of the country baking in record temperatures, while the other side, albeit pretty far off, is experiencing record deluges and destructive floods. And New South Wales on the east coast went from record temperatures (an average 44 degrees Celsius over its entire extent, half as big again as Texas)to constant floods and deluges in a matter of a few weeks. 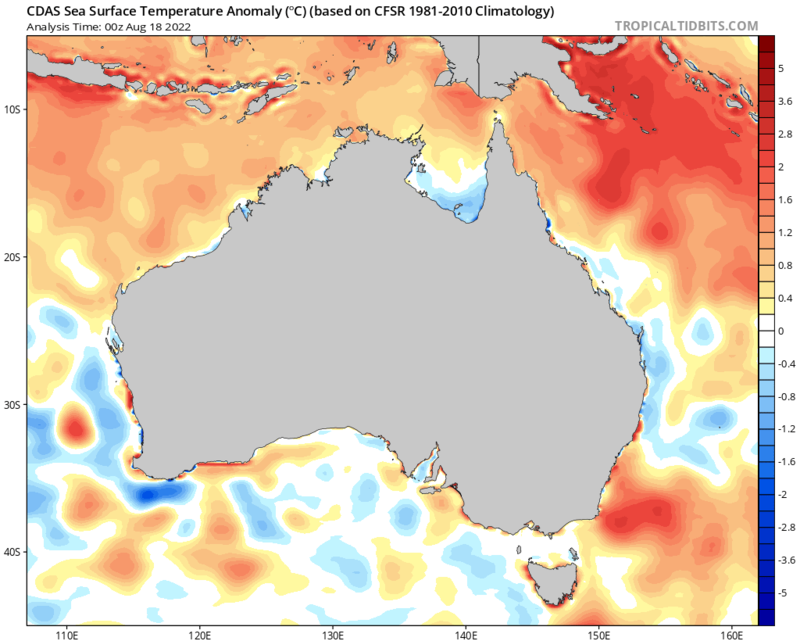 Meanwhile the great Barrier Reef bleaches again, while the Queensland state regime (?Labor? )and the Federal Liberal regime both work frantically to push coal mining and the Adani mega-mine in particular. Public interest is low, as the fakestream media suppress the news, let alone discuss its devastating implications. In a charming example of the media’s behaviour, the ABC’s Drum discussion program last night promised a segment on the world’s reaction to the bleaching, and our seeming indifference. Ironically, but revealingly, that segment never aired, the talking empty heads spending most of the half hour discussing the preparations for the death of the English monarch, and that topic of perennial import, the death of Princess Diana!!!!!!!!!!! Basic complex systems theory, mad oscillation as a system moves from one equilibria to another. I am always stunned though by people’s ability to get used to a new normal really quickly, irrespective of the mainstream media’s misrepresentations. Hopefully, at some point the increasing oscillations will kick people hard enough. People, in the greed-obsessed West, get used to the ‘new normal’ just as long as the victims are other people, preferably in countries far away. Then, when the disasters hit them, they whine in self-pity and demand to know ‘Why weren’t we warned?’. This year’s wet season brings significant flooding to the most densely populated area of the country. Trump’s Budget Sabotages America’s Best Chance to add Millions of high-wage jobs…by Joe Romm at Think Progress. President Trump’s budget slashes investment in clean energy — the biggest new source of sustainable high-wage employment in the world. the loan guarantee program, which jump-started large-scale U.S. solar deployment, the electric vehicle (EV) revolution, and companies like Tesla. States like California, where sanity still reigns, must make alliances with China, India, Germany etc, where renewable energy, electric vehicles etc, are being pursued with vigour. This article – CO2 emissions stay same for third year in row – despite global economy growing when taken in conjunction with this – Carbon dioxide levels rose at record pace for 2nd straight year – gets VERY scary – sounds like we now have some serious earth systems CO2 feedback problems. “Meet the woman whose two-word catchphrase made the military care about climate” . That woman is Sherri Goodman, and she will be in Australia in early April. And the film about climate change and the military will be on ABC TV’s 4 Corners next Monday night. You are unlikely to ever see another climate film like “The Age of Consequences”, so tune into 4 Corners at 8.30pm on Monday night, and find out how the US military really see the challenges of global warming. And yes, they really do get it. A lot better than most politicians. SCREENING DETAILS: “The Age of Consequences”, from PBS International, directed by Jared P Scott and presented by Sarah Ferguson, goes to air on Monday 20 March at 8.30pm EDT. Replayed on Tuesday 21 March at 10.00am and Wednesday 22 at 11pm. It can also be seen on ABC News 24 on Saturday at 8pm, and at ABC iview. This striking documentary investigates the accelerating impact of climate change on increased resource scarcity, migration, and conflict through the lens of US national security and global stability. Through unflinching case-study analysis, distinguished admirals, generals and military veterans take us beyond the headlines of the conflict in Syria, the social unrest of the Arab Spring, the rise of radicalized groups like ISIS, and the European refugee crisis – and lay bare how climate change interacts with societal tensions, sparking conflict. Whether long-term vulnerabilities or sudden shocks, the film unpacks how water and food shortages, drought, extreme weather, and sea-level rise function as “accelerants of instability” and “catalysts for conflict” in volatile regions of the world. Just been on Nullschool and SSTA of 6.4C off Peru! Some coastal areas look pretty wet for the next 3-4 days. “On Friday, drinking water was cut off throughout most of Lima, spiking the price for bottled water and creating long lines at city tanks. U.S. Embassy helicopters typically used to eradicate coca crops in the Amazon were redirected to help in rescue efforts. What can I say, I’m gob smacked. We somehow have to get these ongoing global catastrophes elevated into the MSM. We lobby our governments all the time, how do we effectively lobby the news media? You can’t ‘lobby’ the Murdoch machine-it remains reliably denialist, anti-renewables and ferociously antipathetic to environmentalism. When we understand that good money can be made out of renewables and ecological repair, you can see that this is driven by nothing other than that fanatic Rightwing psychopathy that is destroying the planet. The Amundsen Sea sector of the West Antarctic Ice Sheet has most likely been destabilized and ice retreat is unstoppable for the current conditions. No further acceleration in climate change is necessary to trigger the collapse of the rest of the West Antarctic Ice Sheet, with loss of a significant fraction on a decadal to century time scale. Antarctica has the potential to contribute more than a metre of sea-level rise by 2100. A large fraction of West Antarctic basin ice could be gone within two centuries, causing a 3–5 metre sea level rise. Mechanisms similar to those causing deglaciation in West Antarctica are now also found in East Antarctica. Partial deglaciation of the East Antarctic ice sheet is likely for the current level of atmospheric carbon dioxide, contributing to 10 metres of more of sea level rise in the longer run, and 5 metres in the first 200 years. There are a lot of cited studies here that will give you lots of reading if you can’t sleep! This is the “most popular ever” article at Climate Code Red. It was published Sept. 1, 2010. A very interesting read with predictions of things to come at 1c, 2c, 3c. Reading compare notes of what you’re seeing and some of the then (distant?) future. The failure of international climate negotiations means that if all countries acted on ALL their commitments, the world would still warm by more than 3 degrees, according to Climate Tracker. So what would a world 3 degrees warmer llok and feel like? Scientists draw on a number of disciplines and methods to answer the question, including paleo-climatology (study of past climate history), complex mathematical models of the world’s climate system tested and refined against past climate data, observation of current events and specific research testing hypotheses. Mark Lynas surveyed much of this research for his book “Six degrees: our place on a hotter planet” (Harper Collins, 2007). Drawing from his work and other sources, the following is an overview of some of the scientific projections as the world warms. These are not all certain events, but they are what scientific research thinks is likely. A full set of references on pp. 301-327 of “Six Degrees”. Article on the heroic kids taking on Trump and his FF backers over climate change. As many as 60,000 immigrants could sue GEO Group, one of the largest private prison companies in the United States, for allegedly making immigrants engage in forced work that violates anti-slavery laws. The lawsuit, filed in 2014, asserts that detained immigrants are forced to work for $1-2 a day. GEO and CoreCivic (the other largest private prison company) combined donated nearly $500,000 in support of Trump – half went to a super PAC that helped elect him and the other half went to support Trump’s inauguration. Now, two months into his administration, those donations appear to be paying big dividends. So much can happen when people of good will committed to progressive values and strategic actions gather in homes, shoulder-to-shoulder on couches, folding chairs, and on the floor, and discuss plans to make and keep this country safe, welcoming, inclusive, just, hospitable, and diverse. The movement to resist the Trump administration needs people finding their voices, feeling empowered, and standing up for democracy, justice, peace, and our fragile planet. And this movement is growing stronger one person, one living room meeting, and one action — in concert with so many others — at a time. The Rev. Dr. Andrea Ayvazian, of Northampton, is an ordained minister in the United Church of Christ. She writes a monthly column on the intersection of faith, culture and politics. Donald Trump’s billionaire backers, the Mercers, are big fans of Cave Junction’s own Arthur B. Robinson. When Citizens United went through…we essentially did become an Oligarchy…Now, we will become more like a Russian Authoritarian Oligarchy …with this Evil Trump Regime in charge. The fact that so many of our fellow Americans don’t see it is beyond my understanding. Talk about voting against your self interest…and against a democracy…that is exactly what millions of our fellow Americans did in November. IMO. His view is that as oligarch’s property is protected by the state in modern nations such as the U.S., the oligarchs tend to disarm and take less involvement directly in politics. If the protected status of their property becomes threatened they start to take a much more direct interest, and may even become armed. The advance of renewables directly threatens the worth of the “fossil fuel oligarchs” so not surprising that they are now getting much more directly involved in politics. The unregulated spigot of money into U.S. politics makes this much easier for them. It’s not now just an issue of US oligarchs getting involved. We have global fossil fuel corps and petrostate oligarchs as well. And it’s less oligarchy as an ism and more just direct influence related to powerful and harmful ideological interests that are often related to fossil fuel interests coming to the fore (Ayn Rand has for too long been used as a philosophical justification for the behavior of narcissists and sociopaths). We should be clear that this is an old paradigm of the 19th and 20th Centuries reacting to a revolutionary change in energy markets and attempting to deny the threat of climate change to protect and continue to advance their monetary and related political interests. This block of powers has always sought to erode or remove competing interests. And it was successful due to a combination of economic and political power. But when that power is maintained at the expense of the health of the critical life support systems of the Earth, then it is amoral in the sense that its existence guarantees the decline and likely destruction of modern civilization and an equally amoral destruction of large subsets of life on Earth. My opinion’s been that civilizations decline because the wealthy eventually get control over the levers of power, and then use their control to stifle any sort of innovation or political action that threatens their status. Not happening yet with Silicon Valley, but otherwise seems pretty much on target. Citizens United just part of the process. Bob, Mercer is plainly just another misanthropic hater of other people, albeit an extreme example. Systems, like capitalism, that preference this type, are inherently genocidal and self-destructive. No religion or philosophy have yet found a reliable way to keep these monsters away from power, but capitalism actively preferences them, to all our disadvantage. 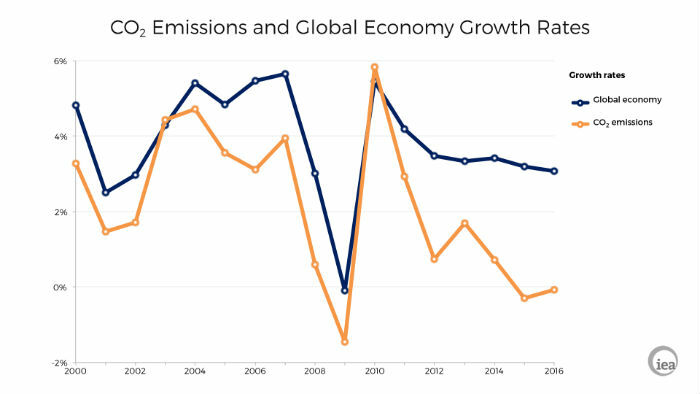 The good news from the IEA is that our economies are decarbonising. The bad news is that our emissions continue to diverge further away from the Mauna Loa readings. Good news, yes, but the way the headline reads “Global carbon dioxide emissions steady for three years, raising hopes of a long-term trend downwards” is misleading to the ill informed. As everyone here knows co2 “concentrations” are still rising despite our best, (so far), efforts. A headline like this could maybe be more instructive to the masses ” Despite global co2 emissions being steady for three years, concentrations are still rising!” Just saying we have to change our way of thinking. This just in (to my slow moving grey matter). I can see the denial-o-sphere using this to say ” hey we’ve cut emissions and the temp is still going up, all natural like we said and not us.” Are good news headlines worded in ways to be used as ammo later? So it’s helpful to stop thinking about this in a reactionary fashion. If you’re dealing with people who are basically dishonest liars, which is the case now, then there is no message that cannot be corrupted. What you have to do is discredit climate change denial as a whole. But yes, we can deconstruct this fallacy. 1. 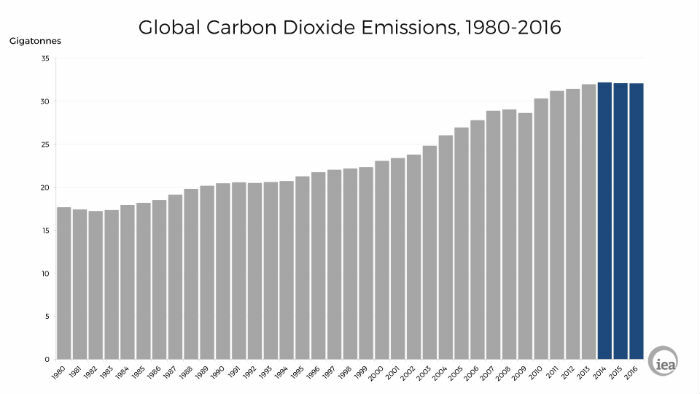 The rate of global carbon emissions has plateaued at near record highs. 2. What this means is that human fossil fuel emissions are about the highest they’ve ever been. 3. Furthermore, the amount of ghg forced into the atmosphere by humans was likely to cause the rate of warming to accelerate when you consider that most of the net gain has occurred over the past 50 years. 4. We would have to dramatically cut emissions (not plateau emissions) to see a slow down in the rate of warming. And it’s likely that we wouldn’t see that slow down for at least a decade or two. We should also point out how full of BS the climate change deniers are. Just two years ago they were trying to claim that warming had paused. So which is it? In the end, their arguments are disingenuous and bankrupt. Anyone with any sense of the history of their arguments will understand that they are intentionally fallacious. They just latch on to the latest big lie and hope that it gains traction. There’s not interest in truthful discussion. They are the new flat earthers. Have to call BS on this, Ailsa. The author gets the definition of neoliberalism and populism dramatically wrong to the point that this is basically revisionist history. Neo-liberalism, which can best be described as conservatism and free market ideology in the US, in no way sought to increase equality. It simply sought to erode the power of governments in favor of shifting power to private individuals and corporations through the deleterious and harmful process of privatization. The neoliberal form of globalization served corporate power expansion not just by opening markets, but by ensuring that there were less and less rules governing fair play in those markets or reigning in abuses by bad actors. And the inherent removal of government programs to help the poor and expand public services associated with neo-liberalism’s austerity amplified this caustic process and widened economic gaps even as it prevented governments from effectively being able to deal with corporate abuses or larger systemic issues like climate change. Neo-liberalism was a big jump away from Keynesian theory (true liberalism not faux neo-liberalism) that relied on government institutions to promote equality and to balance the power of the public and private sectors. And a globalization under true liberalism that redistributed wealth from the top of the economic spectrum to the middle and the bottom and that used helpful regulation to reduce the abuses by bad actors would have been far more benevolent than the system that emerged under neo-liberalism. A more equal system would have been maintained and we wouldn’t see the fractures that we see today. And it is far more likely that we would have dealt with climate change much sooner than now. Populism is inherently a movement supporting equality between the wealthy and the poor. Populism and socialism are related and in the present day U.S. can best be understood through the lens of the policies Bernie Sanders in promotes. Populism typically arises as inequality increases and the poor and middle class suffer. Fake populism — which aims to blame anyone but the wealthy for the plight of the poor and middle class and often focuses rage at minorities and immigrants — has been used by people on the far right like Trump to gain political power and to distract from a continuance of policies harmful to the poor, but who use that power to continue enriching the wealthy. We will have turmoil so long as government continues to be eroded, as valuable public services decline, and as the poor and middle class continue to lose ground. I do like that comment, Robert. I could hardly concur more, and any slight deviations are, no doubt, down to my excessive zeal. Your description of ‘fake populism’ is spot on. It is ‘Divide and Rule’, nothing more, that age-old tactic of despots to ‘keep the rabble in line’. Thank you for your extended commentary on this Robert. I will do some serious homework because I obviously have a lot to learn. I have been in your ‘comment awaiting moderation’ queue for my last few posts, and have been a bit unsure as to what I had done to offend. None intended, I do assure you. The site I quoted from here is a recently set up initiative that includes academia and politicians (green party, etc, from memory). Its so hard to find my way through all this. But I’m trying. During the election, there was a lot of misleading info that got into the forum. I think this happened all over the web, so in an effort to improve the quality of the discussion, I’ve made the settings even tighter. This means that some well intending, but inaccurate or unintentionally subversive, comments may be held in moderation before I can look them over. It also means that I’ll be looking over comments more before I approve them. As for neo-liberalism, the thing to remember is that it is a term that comes from international relations theory. It’s not liberalism at all in the traditional sense. Republicans are mostly new-liberal, for example. The aim of neo-liberalism is economic growth that concentrates wealth at the top of economic spectra. This is achieved through a kind of market colonialism in which corporations serve as the vehicle for wealth and power concentration. Globalism is used primarily to simply open markets to corporate dominance under neo-liberalism. To say that it has anything to do with equality is laughable but I suppose you can give a nod to some of its ideological proponents who appear to believe (against all evidence — as in believing in Santa Claus) that making the wealthy richer helps everyone. The liberal/realism view is more realistic in that it assumes that removal of government oversight creates a state of anarchy that produces bad actors. These theories seek to use policy reign in bad actors and to progress civilization in a more ordered and equal fashion by disincentivizing harmful behavior and promoting benevolent behavior. This is more in line with Democratic thinking in the U.S. And it’s the primary world view that actually produces policies that promote more equality. So neo-liberalism = republicans = laissez faire = inequality = bad actors free to produce massive systemic harms. Many thanks Robert. Clear, concise, much appreciated. Roughly a month’s worth of rain in a night destroys homes in Bujumbura. At least six people have died in Burundi in a night of torrential rain and flooding that triggered landslides and caused widespread damage. Forecasters on Saturday afternoon issued a severe weather warning, noting that areas inland of Evans head in the northern rivers region had received 70mm of rain in just one hour. Rainfall totals of up to 200mm were expected, with parts of the northern rivers and mid north coast already recording more than 100mm since 9am Friday, the Bureau said. At last month’s Conservative Political Action Conference (CPAC), during a little-noticed panel on climate change and environmental regulation, air pollution denial was rampant and went unchallenged. Steve Milloy, formerly a paid flack for the tobacco and fossil fuel industries and member of Trump’s Environmental Protection Agency transition team, argued that excessive air pollution is not linked to premature death. “My particular interest is air pollution,” Milloy said, alleging that EPA’s scientists are inherently biased. “These people validate and rubber-stamp the EPA’s conclusion that air pollution kills people.” Milloy also said, baselessly, that EPA scientists are “paying for the science it wants,” and that Trump must change the research process at the agency. Wow, thats all that needs to be said . …This paper’s findings suggest that an arbitrary Chinese policy that greatly increases total suspended particulates (TSPs) air pollution is causing the 500 million residents of Northern China to lose more than 2.5 billion life years of life…http://www.pnas.org/content/110/32/12936.full As long as you dont look for the truth i guess . Well, clearly creatures like Milloy have NO moral compunctions in taking money from those whose businesses kill, and who know that they kill, tens of millions. Just what sort of system not just empowers such creatures, but keeps them out of gaol? So is the Blob dead? From a surface perspective, the answer is definitely yes; but subsurface data indicate that warm conditions are still lingering below 100m depth in the northeast Pacific. Here in N California we’ve just gone from the worst drought in 1200 years to flooding that caused the State to evacuate nearly 200,000 people last month because of potential dam failure. More drought and flooding, just as projected for decades by scientists. Our infrastructure isn’t designed for this new world of intensified storm systems or rising sea levels as coastal cities watch saltwater back up storm drains onto their streets in sunny weather. If you are interested in data and information regarding the Canadian Arctic and what is occurring. The govt of Nunvut has put up a fantastic portal for climate change related data, observations and information. Jaypeetee Qarpik This is Climate Change in high gear !! Arthur B. Robinson is the fellow who whipped up the famous 33,000 “scientists” who doubt climate change petition . To lobby against Kyoto. It was good to learn he’s also a sheep farmer who keeps 20,000 bottles of human urine frozen at his house in Oregon. The death of mangrove forests stretched over 1000 kilometres of Australia’s northern coast a year ago has been blamed on extreme conditions including record temperatures. About 7400 hectares of mangroves strung along the Gulf of Carpentaria died in a single month in early 2016 because of the unusual warmth, a prolonged drought and an El Nino that reduced local sea levels by about 20 centimetres, said Norman Duke, head of the Mangrove Research hub at James Cook University. Peru death toll up to 72 percent. Too bad Tucker Carlson didn’t have to cover the story. I’ve just added faux news to the filter. Won’t support them through links or otherwise. I only find it interesting that even “faux” has to collide with reality at some point. There is no way around it. They are beginning to get divisions among their own people, as a precious few among them have limits as to what lengths they will go. Those who do have left or leaving or will leave yet. Tucker was so ugly to a polite Bill Nye; no sign he has any lines that he won’t cross to please his superiors. You’re right, T. What they’re doing is unsustainable. It has no internal consistency. And it is so full of self-serving narcissists that they’re bound to turn on each other eventually. Socialism for the wealthy, capitalism for the rest of us. The turkey buzzards returned. They roost in the trees, east of my house during the summer. Thing is, they usually return sometime in May. They’re 2 months early. How odd is that? A year ago, Tourism Tropical North Queensland issued a call for members to “bombard social media with the tsunami of joy” to counter global news headlines suggesting the Great Barrier Reef was in trouble from coral bleaching. A tsunami of a different sort will likely be needed this year as the bleaching has not only returned but is now hitting the key tourist zone from Port Douglas to Cairns and south to Townsville and beyond. Heat stress on corals continues to mount with sea temperatures still abnormally high. There’s also no cyclone or large tropical low on the forecast horizon to stir in cooler waters and provide cloud cover. Looks like near total annihilation to my untrained eye. The oxygen deprived blood coloured blob below Tasmania is where the last remaining remnants of kelp forest are/were clinging on. This is not good. And it’s getting worse. Typically, the capitalist can only think of his precious profits. That this is a disaster for not just the Reef, its life and the local tourist industry, but for the country, humanity and Life on Earth, is beyond these protozoa’s ability to comprehend. They ONLY exist to make money and consume things, and cannot even notice when their excretions are killing the world around them. To tweet or not to tweet at Donald Trump? That was the question! Knowing Twitter to be the prefered means of communication for the current POTUS and that he “may” have a thing or two to learn about climate science, John Mason recently set out to explain the carbon cycle in a series of 49 tweets in a language we hoped Donald Trump would be able to grasp. Tweet at him. But don’t expect sympathy. Tweet at him as you would a bully — to call him out for BS and to hold him accountable. And to continue the endless process of educating his supporters/sympathizers. Want an example? In February, Harvard University proudly screened a new film called The Great Transition as part of what it calls its Rational Middle Energy Series — programs designed to explore the future of energy. Harvard says the series is predicated on “a need and desire for a balanced discussion about today’s energy issues.” The screening took place at the Harvard Kennedy School’s Belfer Center. Here’s what the people who watched the film were not told. Shell was the sponsor of the event and was also the producer of the film. The director is vice president of a family-owned oil and gas company and has received nearly $300,000 from Shell. The Harvard Kennedy School has received at least $3.75 million from Shell. The discussion panel at the screening included a Shell vice president. Want more? The film claims natural gas is clean energy but does not mention the deadly methane emissions that fracking to release natural gas from the ground causes. It goes on to say that renewable energy solutions are “a very long time off.” Richard Newell, identified as a former administrator at the US Energy Information Administration, is featured in the film. “You can get 50% reductions in your emissions relative to coal through natural gas,” he says without mentioning that the Energy Initiative he founded and directed at Duke University was funded to the tune of $4 million by an executive at a natural gas company. Moles, moles everywhere moles. For the want of a weasel. Massive beasts like mammoth, mastodon and saber-toothed tiger suddenly vanished around 10,000 BC together with Clovis people at the end of the last ice age – nobody knows why. A Recent discovery of platinum in large quantity across US archeological sites stir a possible explanation to this mystery. Platinum is an element that has a strong connection with cosmic matters like asteroids. Science has long accepted the idea that there was a sudden drop in temperature 12,800 years ago that spanned for the next 1,400 years. This event is called the Younger-Dryas period which coincides with the extinction of Clovis people and the age of massive beasts. However, it baffles scientists because no one can conclude the trigger behind Younger-Dryas. Since Harvard University found a large deposit of platinum in an ice core from Greenland in 2013, scientists began linking it with Younger-Dryas. The theory of an extraterrestrial impact is now gaining a foothold after soil layers in Arizona, California, New Mexico, North Carolina, Ohio, South Carolina and Virginia revealed platinum in soils. Science Daily reported that Moore stressed the connection between an asteroid impact and extinction of the Clovis people together with 35 species of massive ice-age animals. Ironically, a similar event happened 65 million years ago and caused the extinction of dinosaurs. The second cosmic impact is known as the Cretaceous-Tertiary period. To recall, there is also a well-studied phenomenon where scientists found another cosmic matter iridium. Moore explained that both platinum and iridium cases resulted to the atmospheric fallout of rare elements. About the issue of missing impact crater, Moore suggests that the large cosmic object might have struck an ice-sheet or have exploded in the atmosphere. Thanks for this one. Always had an interest in the Younger Dryas. Huh, interesting stuff. The Science Times article reads almost as if it were produced by a computerized writer, but the Science Daily item it links to is quite good. Interesting because extinction of megafauna (mammoths, mastodons) in North America has previously been ascribed to the arrival of humans, which occurred at roughly the same time. Would be nice for us to be off the hook for that criminal deed–we have so much else to answer for. The wealthy GOP donors and Trump’s chief strategist collaborated on at least five ventures. Corporate capture of academic research by the fossil fuel industry is an elephant in the room and a threat to tackling climate change. Michelle Michot Foss, who offers skepticism about battery production for renewables, is identified as the Chief Energy Economist at the Center for Energy Economics at the University of Texas at Austin. What’s not said is that the Energy Institute she founded at UT Austin is funded by Chevron, ExxonMobil, and other fossil fuel interests including the Koch Foundation, or that she’s a partner in a natural gas company. You may notice a pattern. The very experts we assume to be objective, and the very centers of research we assume to be independent, are connected with the very industry the public believes they are objectively studying. Moreover, these connections are often kept hidden. To say that these experts and research centers have conflicts of interest is an understatement: many of them exist as they do only because of the fossil fuel industry. They are industry projects with the appearance of neutrality and credibility given by academia. After years conducting energy-related research at Harvard and MIT, we have come to discover firsthand that this pattern is systemic. Funding from Shell, Chevron, BP, and other oil and gas companies dominates Harvard’s energy and climate policy research, and Harvard research directors consult for the industry. These are the experts tasked with formulating policies for countering climate change, policies that threaten the profits – indeed the existence – of the fossil fuel industry. Down the street at MIT, the Institute’s Energy Initiative is almost entirely funded by fossil fuel companies, including Shell, ExxonMobil, and Chevron. MIT has taken $185 million from oil billionaire and climate denial financier David Koch, who is a Life Member of the university’s board. The trend continues at Stanford, where one of us now works. The university’s Global Climate and Energy Project is funded by ExxonMobil and Schlumberger. The Project’s founding and current directors are both petroleum engineers. Its current director also co-directs Stanford’s Precourt Institute for Energy, which is named after (and was co-founded by) the CEO of a natural gas company (now owned by Shell). Across the bay, UC Berkeley’s Energy Biosciences Institute is the product of a $500 million deal with BP – one that gives the company power over which research projects get funded and which don’t. The non-renewable energy industry has a flawless plan to forever own the discussion on global warming. This cabal of oligharcs has billions on dollars ready to protect their trillion dollar assets still underground. In 2009, they invested $30 million to elect 39 republican and 33 state legislatures controlled by republicans governs and at least 42 gerrymandered republican Cong Reps.
We do not have the money nor the time to turn that around because we do not have a national media worthy of respect. We cannot win the political fight in time to mitigate CO2 atmospheric increase as we wait to see the consequences of air pollutants no longer dimming solar input. I am beginning to see a denial among AGW believers that divestiture and all the other non-fossil fights can actually get us to net-zero emissions. Dr. Peter D. Ward, UWA palio-geologist and expert on the origin and effects of the first great extinction. We are on the road to the sixth and our children and their children, your grandchildren, will suffer to the end. Sea level rise is a $1.5 trillion housing bubble but it also inundated Arthur Kill landfill, in NYC, at sea level. 405 nukes at sea level. Houston ship channel and Elizabeth, NJ oil refineries are at sea level. It is beyond comprehension what all of that flooding will do to the coastal oceans around the globe during a global financial crash. It is long past the time the elders begin to speak the whole truth about our planet’s response to 1.5 degrees and what earth’s history tells us of the consequences of that…now, we face a certain 2 degrees and verging on run away climate. Our children have a right to know and understand why they must demand protection. This is their Viet Nam moment. They have the smarts and we have the money to begin their adapting to a future we can only hint at while scientists tell us it will be far worse than we believers are wiling to say. It is honorable to yell FIRE in a burning movie theater. Yes, it is doomsday talk but honest. How the public will respond has to be considered but I take some heart in seeing how more public are becoming aware. “After a drop of almost 262 thousand km2 in just three days, it looks highly likely that the maximum for sea ice extent was reached two weeks ago, according to the data provided by JAXA, the Japan Aerospace Exploration Agency. Australia is surrounded now by huge blocks of die – offs. The reef, in the East , the mangroves in the North , the kelp forests & sea grass in the West and South. And nobody notices, while the Murdoch metastases screech that it is all just a ‘Greenie’ conspiracy. LakeOroville at 860′ and dropping with OrovilleSpillway at 41,000 cfs and Hyatt at 7,550 cfs. WASHINGTON ― Donald Trump took the oath of office two months ago, but is not yet running a real presidency. His administration, thus far, largely is playing like a junta that surprised the royal guards and seized the palace ― while still remaining unable to pacify the capital city, let alone inspire the countryside. One of my favorite song lines.. “And I was campaign shouting like a southern diplomat”. I used to hang out on site for politics, as time went by I found myself posting more, and more climate links. Finally the host , Craig Crawford, asked me for “solutions” . I said there are no “solutions”, our cake is baked. Things went downhill after that. Our current state of affairs reminds me of Imperial Praetorian Guard auctioning off who would become the next emperor , after they had a had in murdering the last one. But bread and circuses , still roll on, you got NASCAR and MARCH MADNESS , and pizza on the I-phone, what could possibly go wrong ? After the death of Sejanus, who was sacrificed for the donative (imperial gift) promised by Tiberius, the Guards began to play an increasingly ambitious and bloody game in the Empire. For the right price, or at will, they assassinated emperors, bullied their own prefects, or turned on the people of Rome. In 41, Caligula was killed by conspirators from the senatorial class and from the Guard, along with his wife and daughter. The Praetorians placed his uncle Claudius on the throne, daring the Senate to oppose their decision. In 69, the Year of the Four Emperors, after the emperor Galba failed to provide a donative for the Praetorians, they transferred their allegiance to Otho and assassinated the emperor. Otho acquiesced in the Praetorians’ demands and granted them the right to appoint their own prefects, ensuring their loyalty. After defeating Otho, Vitellius disbanded the Guard and established a new Guard sixteen cohorts strong. Vespasian relied in the war against Vitellius upon the disgruntled cohorts the emperor had dismissed, and reduced the number of cohorts back to nine upon becoming emperor himself. As a further safeguard, he appointed his son, Titus, as Praetorian prefect. I also have gut feeling that Nature is about to really start voting. On a scale none of us ever dreamed of. Of course it could be knocked off the news s by 20th annv. of the death Dianna. Which got 2 mins.on CBS yesterday morning with William going to France, the death toll in Peru got 20 secs.